President Eyring teaches that prayers can be answered in many different ways. 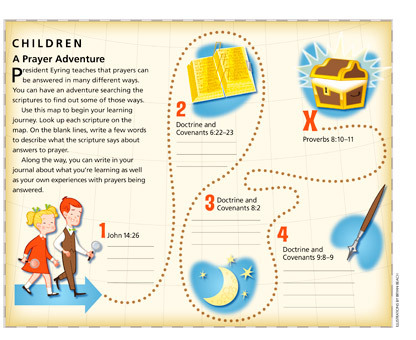 You can have an adventure searching the scriptures to find out some of those ways. Use this map to begin your learning journey. Look up each scripture on the map. On the blank lines, write a few words to describe what the scripture says about answers to prayer. Along the way, you can write in your journal about what you’re learning as well as your own experiences with prayers being answered.